Amsterdam is experiencing a restaurant boom. A couple of weeks ago Amsterdam's local newspaper Het Parool reported that the Amsterdam dining scene has grown by 27% in the past 5 years, and that the Dutch capital currently has now fewer than 4 new restaurant openings a week. As is inevitable with booms: There is the good and the bad, the great and the low and the just and the unjust (Albert Camus). One of the most anticipated recent openings has been Restaurant Breda ("Breda"), a new restaurant by young guns Freek van Noortwijk (27) and Guillaume de Beer (27), who previously worked at restaurant Daalder (also in Amsterdam). Restaurant Breda is their second Amsterdam venture; last year they opened the wonderful Guts & Glory on the Utrechtsestraat. Also part of the team (and co-owner) at Breda is Johanneke van Iwaarden (27), an enthousiastic and talented sommelier. The restaurant opened its doors in December 2015 and is named after Freek, Guillaume and Johanneke's common birth place Breda, a market town in the south of the Netherlands. Breda is open daily for lunch and dinner. 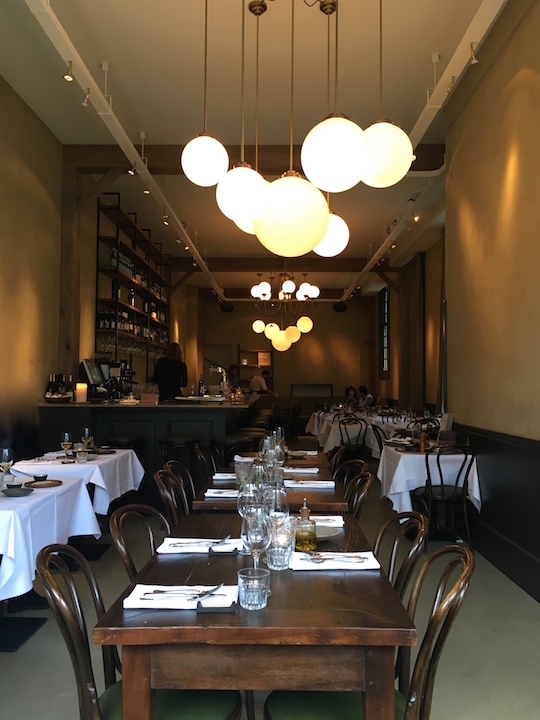 At lunch the restaurant serves a (daily changing) 3, 4 or 5-course surprise tasting menu (3 courses €29.50, 4 courses €36.50, 5 courses €42.50) and in the evenings you can go for the Basic (around 5 courses, € 47.50), the Extra (around 7 courses, €62.50), or the Full Monty (around 9 courses, €77.50) surprise tasting menus. I had lunch with my husband at Breda on Saturday 16 January 2016. We requested and we were served the Extra menu and we ordered an extra cheese course. *I was recognised and I believe I may have been served 1 or 2 extra courses, but I don't know which ones. Lunch kicked off with some nibbles. 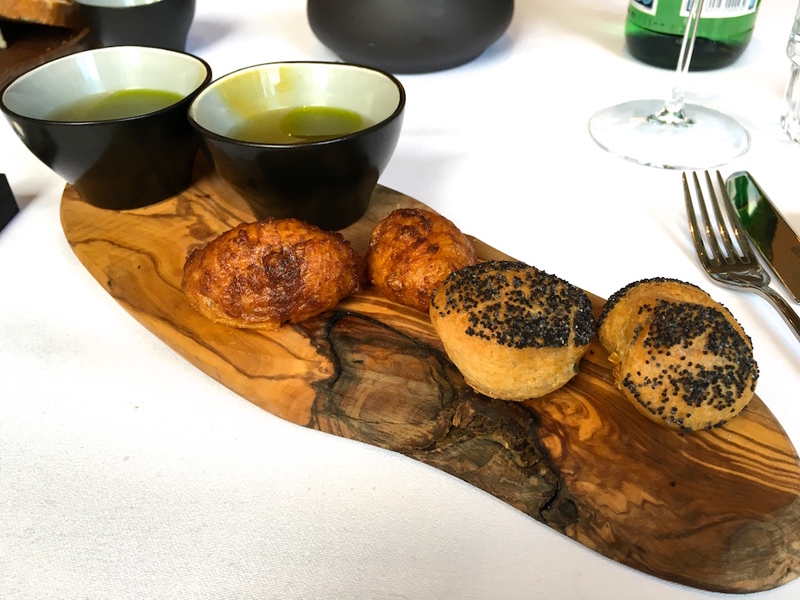 There was a dainty puff with a delicious creamy mushroom filling, a rich and soft deep-fried potato soufflé, and a small bowl of vegetable soup (made with bits and bobs of leftover veg) served with some lovage oil, the latter delivering a lovely finish. 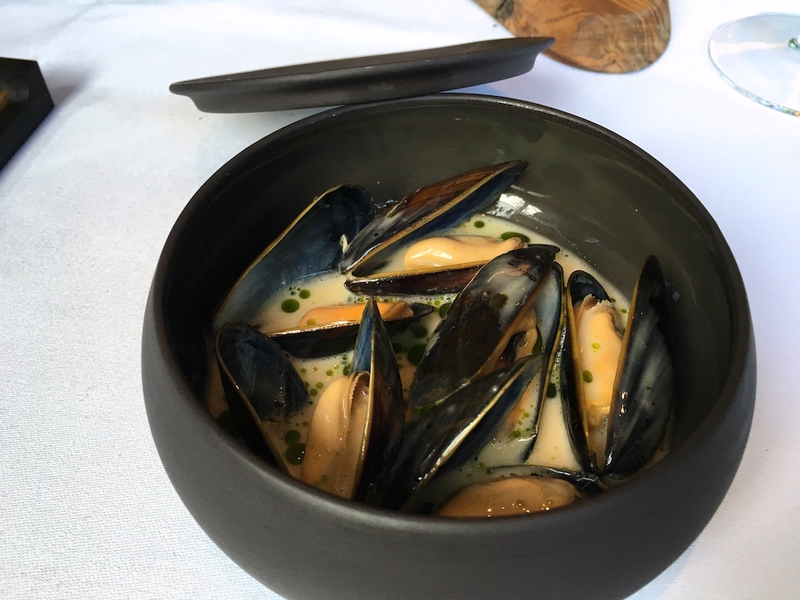 This was followed by an amuse bouche (to share) of nice and plump mussels, served with a gorgeous sauce from the mussel cooking juices thickened with smoked butter, and some parsley oil. A fiddly and messy dish to eat but the flavours were wonderful, and the parsley balanced the richness nicely. 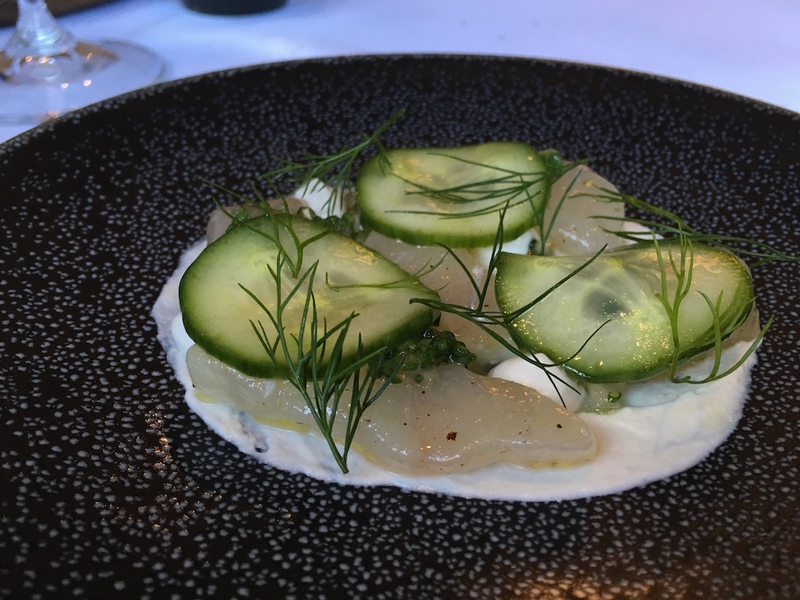 The first course was cured and marinated corvina fish topped with a mignonette-like dressing of finely chopped chives, shallots and vinegar, and served with crème fraîche, a few dots of oyster crème, fresh dill and thin slices of pickled cucumber. A lovely selection of attractive, fresh and bright flavours, with a wonderful synergy between creaminess and sharpness. The acidity in the dressing brought a nice zing to the dish. Second course was a carefully arranged "salad" of tender razor clams, fennel, green apple, crunchy croutons, and herring caviar, garnished with wild fennel. With the salad came a a creamy seafood sauce (clam cooking juices and fish broth), delicately flavoured with Noilly Prat and Pernod. 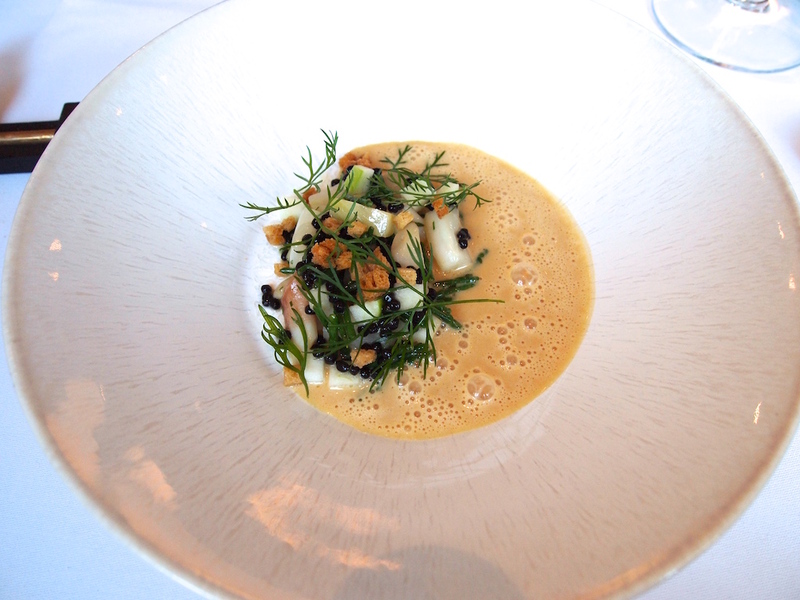 An elegantly rich dish, the aniseed flavours enhancing the sweetness of the razor clams wonderfully. Great textures too. 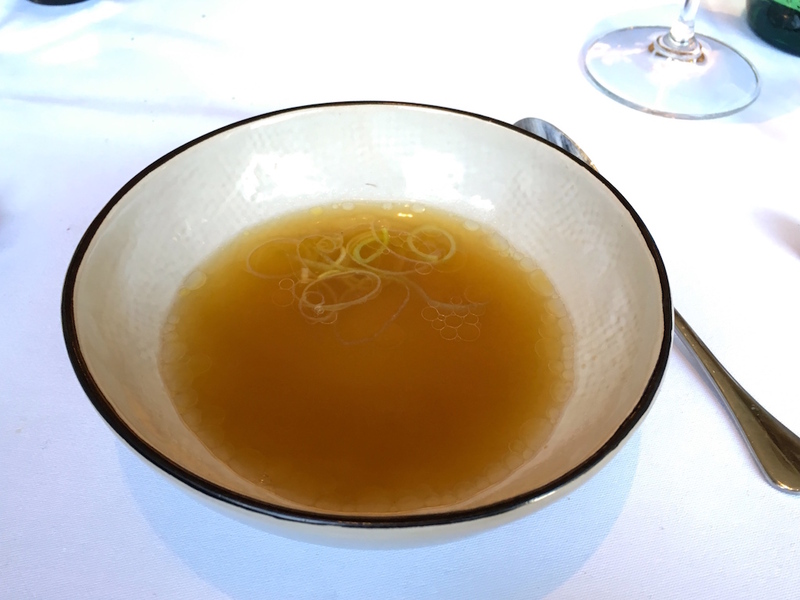 Next we were served an incredibly umami-rich, smoked eel skin broth seasoned with a few drops of eel fat and vinegar, and with some thinly sliced leeks in there for texture. Eels are slipping on and off the endangered species list these days and Freek van Noortwijk explained to that he and Guillaume wouldn't feel comfortable having eel on the menu. For this dish they buy just the eel skins, a by-product which Dutch eel smokeries would normally discard. 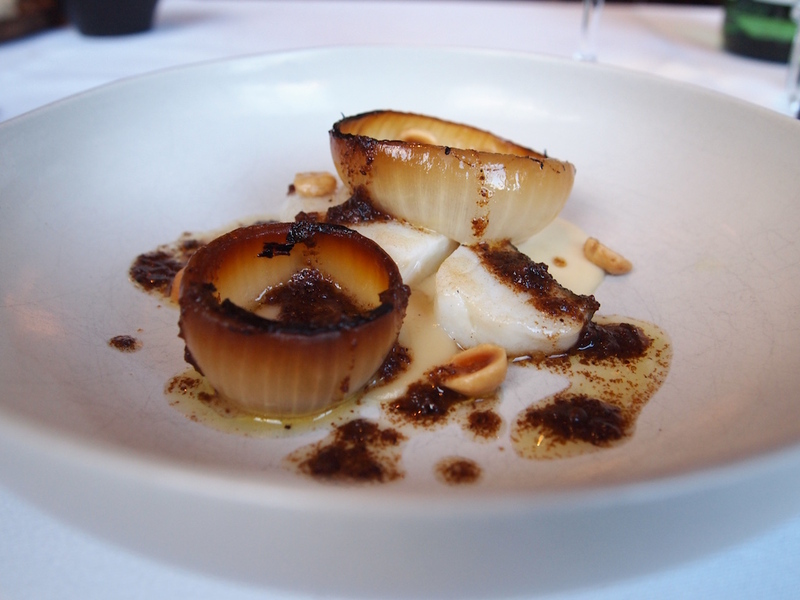 Fourth course was buttery cod served with charred onion petals, Époisses crème, caramelised onion puree and a terrific beurre noisette bolstered with confit mustard. An excellent pairing that worked both in flavour and in texture, and a great example that fish and cheese do go together. I particularly liked the beurre noisette, it's deep nuttiness working so well with the other ingredients. 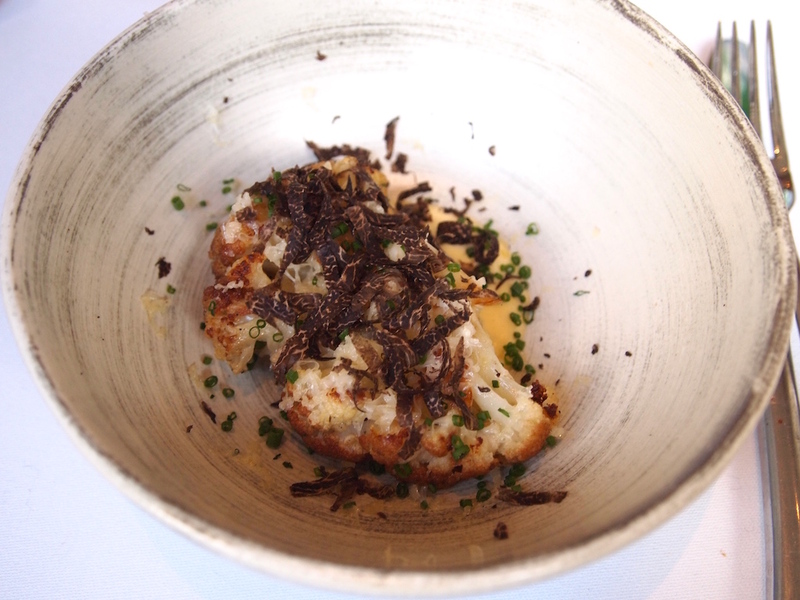 Even better was the next course of cauliflower fried in beurre noir complemented by a Hollandaise sauce flavoured with ham stock, and garnished with finely chopped chives and freshly grated black truffle. A modest but exquisite dish. Adding ham stock to the Hollandaise gave the sauce a lovely touch of meaty saltiness. 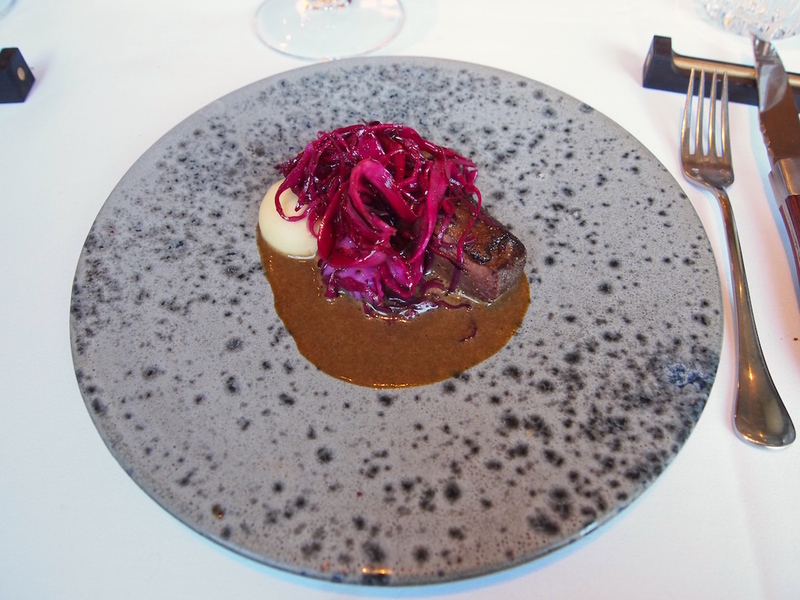 On to the sixth course, duck (cooked medium-rare) served with lightly pickled 5-spice red cabbage, a light turnip puree mildly flavoured with white chocolate, and a duck sauce. Loved the fresh, crisp crunch from the pickled cabbage, which was well-made with subtle spicing and just the right level of sharpness. A very enjoyable dish. 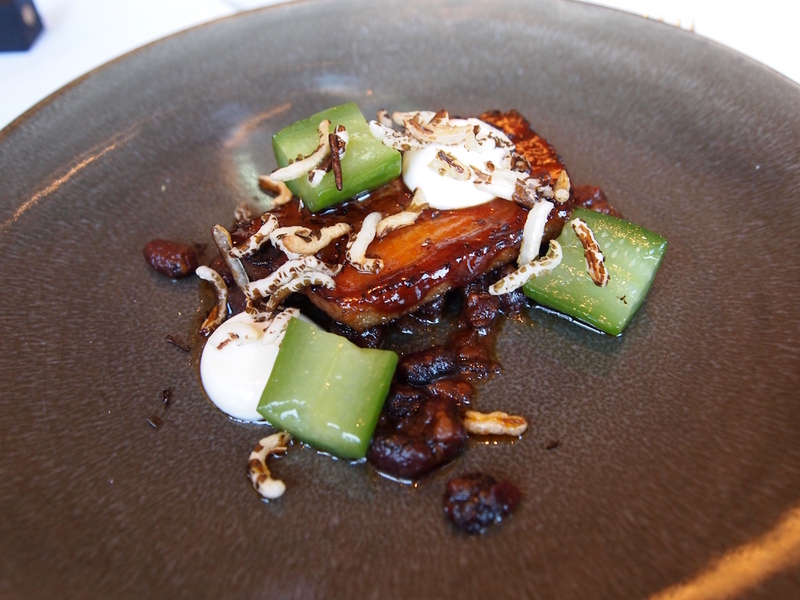 Equally enjoyable was soft belly pork, lacquered with hoisin, served with spicy black beans, puffed wild rice, and some sour cream and compressed cucumber for balance and freshness. This dish used to be Guillaume and Freek's signature dish during their time at Daalder and I'm really happy to see that this truly lovely dish has accompanied them to their new restaurant. It's also great to see that the dish has evolved and gained finesse, both in flavour and in presentation. 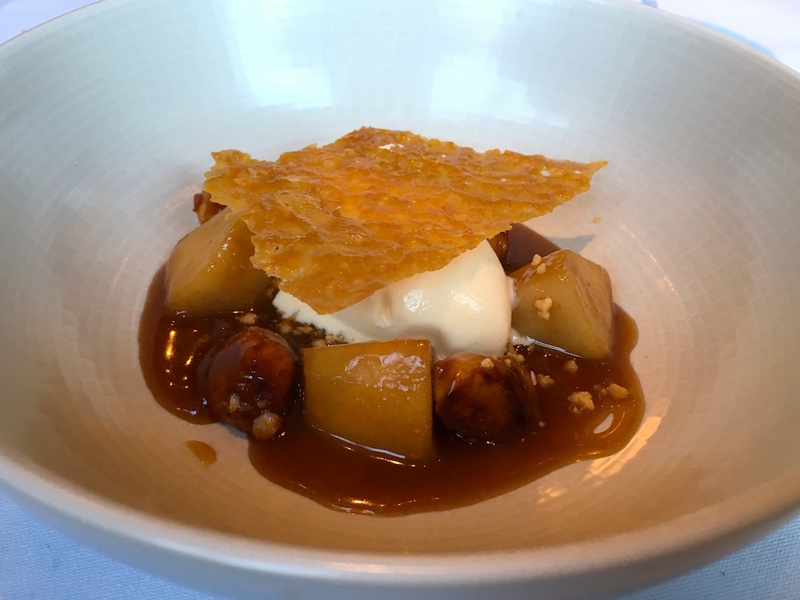 A dish of foie gras with soft pear, caramelised pecan nuts, pear puree and smoked Jerusalem artichoke ice cream followed. 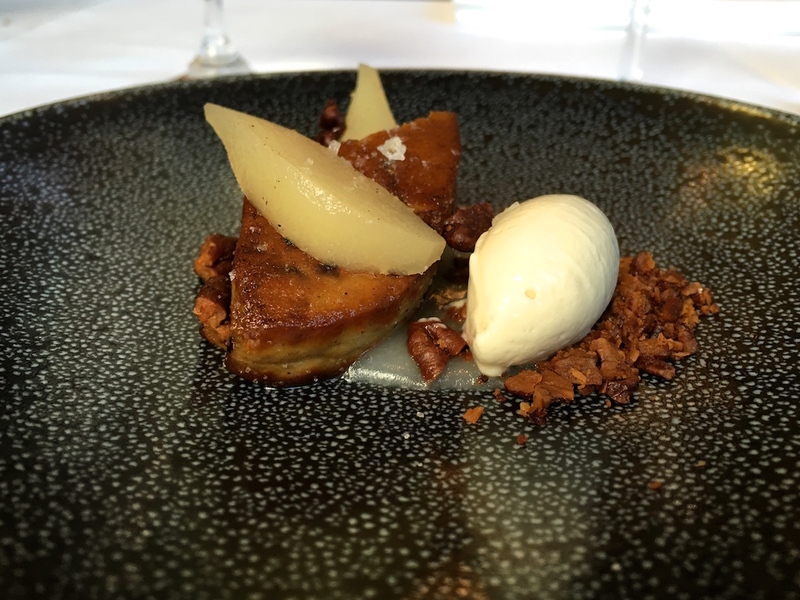 A pleasing combination, the smoked ice cream giving the classic pear-foie gras pairing a nice, original edge. Before dessert we shared a cheese course. On the board were three lovely cheeses, Pierre Robert, Crayeux de Ronq and Blue de Brébis. Some appelstroop (a type of syrupy apple treacle) and raisin crackers were served on the side. Pre-dessert was white chocolate mousse with beetroot puree and beetroot meringue. A intelligent combination of contrasting flavours, the chocolate mousse adding a lovely touch of creaminess. Shortly after this was followed by dessert proper, composed of vanilla ice cream, salted caramel, macadamia nuts, soft caramelised apple and crisp chicken skin. A wonderfully delectable combination of flavours and textures, the chicken skin adding some lovely saltiness. Personally I'm not big fan of surprise tasting menus. I like to know what's in store and I am perfectly capable of selecting those dishes which I feel like eating. I'm not sure if it is good for business either and why would a restaurant that is such a personal venture, want to be so uncommunicative to its potential guests? That said, with this meal Freek van Noortwijk and Guillaume de Beer have proved to me once again that they are true mavericks on the Amsterdam dining scene. Today's deceptively simple dishes were a display of originality, creativity and skill; out-of-the-box cooking that is a breath of fresh air. The chefs know how to handle ingredients properly, the flavours sure pack a punch, but they are balanced and refined at the same time. I was already impressed with the cooking at Daalder and at their more experimental restaurant Guts & Glory, but it sparks me with excitement that they are taking things to the next level at Breda. Now chaps, just go and print those bloody menus.